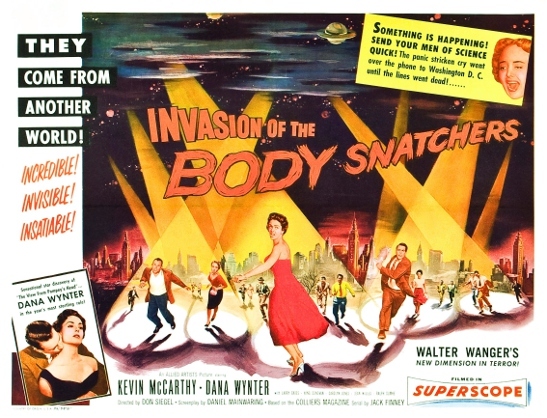 It's hard to believe, but the now-commonplace sci-fi trope of "pod people" originated with Don Siegel's Invasion of the Body Snatchers (1956), itself based on Jack Finney's three-part serial released earlier in the decade. Our story takes place in fictional Santa Mira, California -- a location later used in over a dozen movies and TV shows, including Halloween III and Memoirs of an Invisible Man -- where a number of strange incidents have been, more often than not, written off as "mass hysteria". Dr. Miles Bennell (Kevin McCarthy) has witnessed a few first-hand, with patients claiming that friends and relatives have been replaced by imitations. Miles confides in former girlfriend Becky Driscoll (Dana Wynter), but their joint suspicions are quickly confirmed at the home of mutual friend Jack Belicec (King Donovan) and his wife Teddy (Carolyn Jones): an unconscious body has been found on site bearing Jack's exact likeness, but it's...not quite fully formed. That'll happen soon enough. Santa Mira's problem grows exponentially within hours, so it's no surprise that the bulk of Invasion of the Body Snatchers occurs during the course of only a day or two. Our story is permanently fixed on the perspective of Miles and Becky, from the evidence they see -- which is, in most cases, not witnessed by others -- to the "pod people" they encounter, who literally grow and multiply at an alarming rate. The way in which the mystery gradually unfolds is perhaps the key reason why this adaptation works so well: it's over and done with in just 80 minutes, a streamlined and virtually fat-free production that was initially shot in just 23 days. 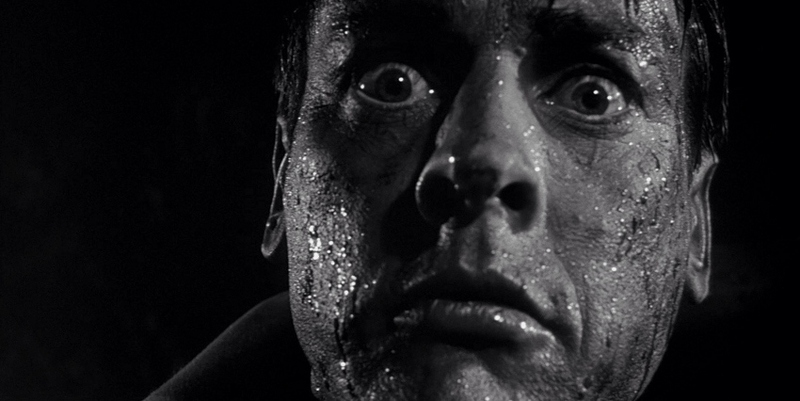 The end result wasn't quite that simple, however: among other changes to Siegel's original cut, a bookending hospital scene (which basically makes the epidemic a partial flashback with room to breathe at the end) was added after test audiences and studio executives were terrified by the original "You're next!" ending. It's not the worst compromise, all things considered, and at the very least might be a big reason why the 1978 version ended the way it did. 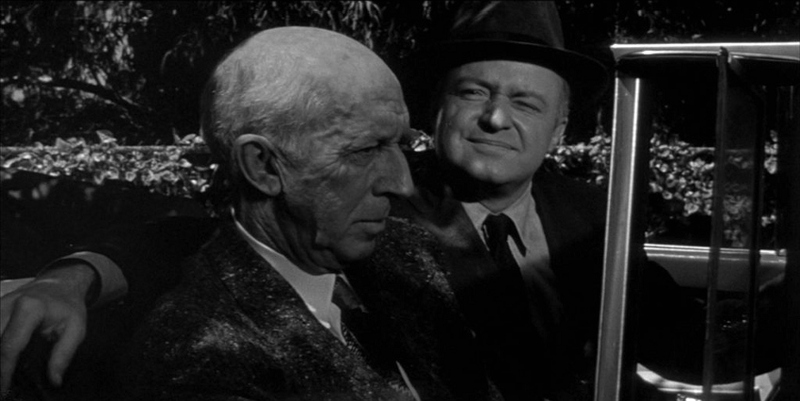 But considering Siegel's cut -- not to mention the original camera negative of this theatrical version, which was printed for SuperScope framing (cropped to 2.00:1) -- has been lost or destroyed since then, we're stuck with what's left and it's still damn good. That's another way of saying that Invasion of the Body Snatchers still packs a wallop, and the existence of several remakes -- most notably, Philip Kaufman's effective 1978 version -- prove it's a durable story that, when handled correctly, can work in any generation. When it's not handed correctly, you either end up with a flawed but interesting side-step or a total mess. Sadly, the original film's path to home video has been surprisingly inconsistent: though it was granted a Criterion laserdisc (only their 8th release, and all the way back in 1989!) and a Republic Pictures DVD less than a decade later, things fell silent until Olive Films' 2012 Blu-ray which looked and sounded good but featured no extras. The reason for such a long break? All that and more is answered with Olive Films' new Signature Blu-ray, easily the best home video edition to date. Read on for more! 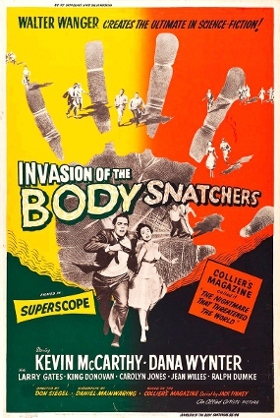 Presented in its theatrical "SuperScope" 2.00:1 aspect ratio, Invasion of the Body Snatchers looks about as good as its source material will allow -- especially since it's worth noting that the original camera negative apparently no longer exists. That said, those who already own Olive's 2012 Blu-ray will notice a marginal jump in quality: the main feature boasts a higher bit rate on this new encoding, as well as better gamma levels that give deep blacks a bit more punch. Grain, texture, and overall image detail also appear slightly better resolved in motion -- but I'll be honest and say that the 2012 disc looked (and still looks) pretty solid to my eyes, and the negligible improvements here may not even register with some audiences. Either way, this new Blu-ray easily gets passing marks under the circumstances and, more than likely, it won't look better on this format. DISCLAIMER: The images on this page are decorative and do not represent the title under review. Although the DTS-HD Master Audio 2.0 (split mono) track sounds good for its age, Olive loses a point for not securing a restored three-channel Perspecta Stereophonic track remastered by Paramount in recent years (which, to my knowledge, was exclusive to select theatrical showings). But at the risk of whining over "what could have been", this mono track is still very much a capable effort with clean dialogue, well-balanced music cues, and no obvious defects or syncing issues -- any perceived shortcomings are, again, part of the source material used. More or less, this mix sounds exactly like the 2012 Blu-ray, so if you enjoyed that track you'll know what to expect here. One improvement over that disc, however, is the addition of optional English subtitles, which should be mandatory on all mainstream releases. Sadly, they're including during the main feature only. Olive's standard interface includes chapter selection, subtitle setup, and bonus features. Loading time is fast with no trailers or advertisements beforehand, aside from the company logo (which really, really needs an update -- it looks like it was made during lunch break). Unlike standard Olive releases, this Signature Edition arrives in a clear keepcase with double-sided artwork, a matching slipsleeve that doesn't fit right, and a Booklet with an essay by author and film programmer Kier-La Janisse. Unlike Olive's 2012 Blu-ray, this Signature Edition is loaded with extras, and all of them were either created specifically for this disc or never released on home video before. Things start off strong with two full Audio Commentaries; the first features film historian Richard Harland Smith, while the second groups together Kevin McCarthy and Dana Wynter with filmmaker Joe Dante. For starters, it's important to mention that both McCarthy and Wynter died in 2010 and 2011 respectively, so that fact that this older commentary (plus several other extras featuring both actors, which were produced for a 2006 disc that never materialized) has finally seen the light of day is simply fantastic. 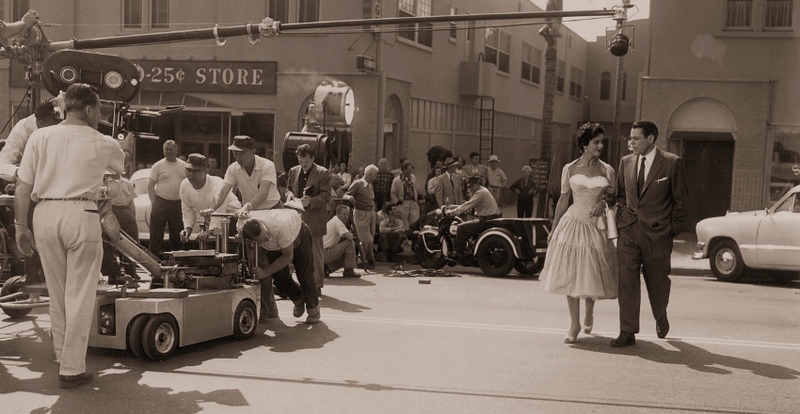 Collectively, both commentaries cover topics including the film's working titles, the bookending hospital scenes and Don Siegel's original cut, Kevin McCarthy and Dana Wynter's early lives, shooting locations, supporting cast members and bit parts, the visual effects, Carmen Dragon's original score, Kevin McCarthy's films with Joe Dante, Don Siegel's early work as an editor for Warner Brothers, The Hot Dog Show, Jack Finney's original stories, the film's intense three-week shooting schedule, and much more. Both commentaries are enjoyable for different reasons; Harland's is well-organized and steady, while the group track is more conversational and full of first-hand memories. A number of interviews and appreciations, most of which discuss the film's production and legacy, are up next. "The Fear is Real" (12:26) sits down with filmmakers Larry Cohen and Joe Dante, who discuss Invasion of the Body Snatchers' cultural significance during its era and relevance in later decades. "The Fear and the Fiction: The Body Snatchers Phenomenon" (8:19) covers similar territory, as McCarthy and Wynter -- as well as film directors John Landis, Mick Garris and Stuart Gordon -- pay tribute to the film and its unintentional symbolism. "Sleep No More: Invasion of the Body Snatchers Revisited" (26:34) talks about the film's adaptation and cultural relevance with comments from the previous participants as well as admirers including W.D. Richter, film producer Bob Burns, cultural historian Leo Braudy, and others. An archival 1985 Kevin McCarthy Interview (7:25), hosted by Tom Hatten, has the actor speaking briefly about the intense production, the bookending scenes, Sam Peckinpah's cameo, and more. Finally, "The Stranger in Your Lover's Eyes" (11:54) is a two-part visual essay by Kristoffer Tabori, son of director Don Siegel, who reads from his father's book A Siegel Film and shares his own thoughts about the movie. A few odds and ends cover other aspects of the production that might be less familiar to fans. "I No Longer Belong: The Rise and Fall of Walter Wanger (21:08) is a thoughtful overview of the life and career of the film's producer by film scholar and author Matthew Bernstein. "Return to Santa Mira" (8 clips, 12:32 total), though limited in scope and execution, offers a lightweight and breezy tour of several filming locations. "What's In a Name?" (2:16), meanwhile, offers is similarly fluffy but enjoyable history lesson about the film's title. Winding down is a short Photo Gallery of a dozen rare documents detailing aspects of the film's production, including the never-produced opening narration to have been read by Orson Welles. Finally, we get the film's original Theatrical Trailer (2:15), which is in very rough condition but presented in a 1.33:1 (open matte) aspect ratio. 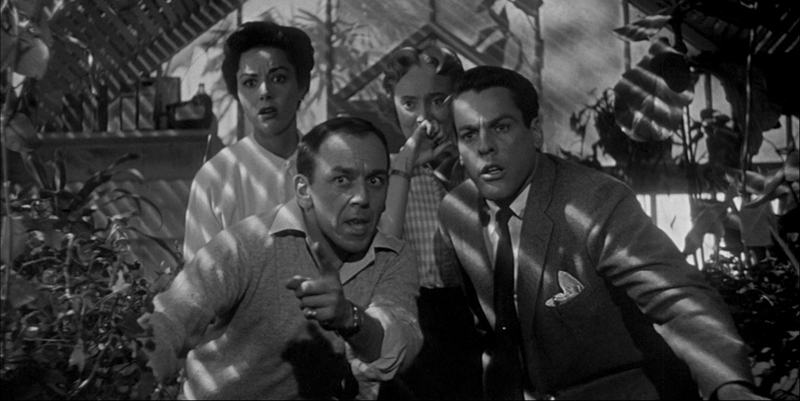 Don Siegel's Invasion of the Body Snatchers remains a tight and well-constructed adaptation of Jack Finney's original story; it's been brought to film several times over, but this black-and-white production is still neck-and-neck with Philip Kaufman's effective 1978 version. Featuring terrific performances by the late Kevin McCarthy and Dana Wynter, a heavy atmosphere, outstanding effects, and a frenetic pace that matches its tight 23-day shooting schedule, this is still a great time at the movies more than 60 years later. If not for studio interference, it'd be damn near perfect. Olive Films' new Signature Edition Blu-ray is a welcome upgrade of their own 2012 disc, serving up a slightly improved transfer (but missing a restored 3.0 audio mix) and a mountain of outstanding extras, many of which were rescued from an abandoned 2006 edition with appearances by the late actors. It's obviously worth an upgrade for those who love digging through extras, not to mention the definitive home video edition for those who don't own it yet...and according to reports, almost sold out already. Highly Recommended.